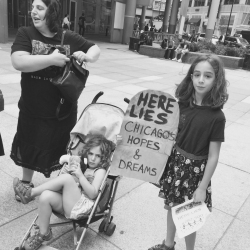 Amid another year of budget cuts, mothers of public school students across the city stood outside the Thompson Center Wednesday morning to demand Mayor Emanuel and the City Council put an end to education cuts. “Multiple years of cuts have already left students with a skeletal school system,” said one parent. “With bare-bones budgets, children are getting a bare-bones education. There is nothing more to cut.” Schools across the city have experienced cuts in art, music, sports, world languages, after-school programming and field trips. 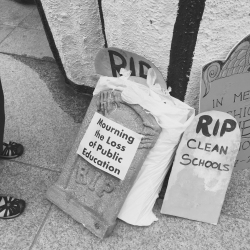 With the most recent cuts, losses to district-run schools since 2013 will total $300 million, not including the closure of 50 neighborhood schools. In addition to the $60 million in school-level budget cuts for 2015, there will also be district-wide cuts for building engineers, special ed assistants, bussing and coaches.